Longtime reader and piker poster here. Thought I'd share some pics of my most recent couple of levergun acquisitions. I'm mostly a vintage military collector and shooter (Garands, SMLEs, K98s, SKSs, etc. Cold War era guns), but I've owned a few levers over time. Been without one for years now and reading y'alls thoughts regularly on this forum caught me the bug again! About a year and a half ago I decided to find an original Marlin 1894C, mostly because I shoot a bunch of .357 now and love the carbine/revolver pairing idea. I hunt in VA and shoot an old pre-lock 6" 686-3, carry a 66-2 sometimes, etc. Long story short this turned into a long running 1894C fever thing, and I've ended up with a pair of them. One built in 1982 (blue trigger) now sports an old Redfield receiver sight I was lucky enough to find on ebay recently, and the other one built in 1980 (gold trigger) is wearing an El Paso Weaver K3-W. My aging eyes can no longer handle barrel-mounted sights (in other words I now stink at anything other than short range shooting with my K98s... sigh...). 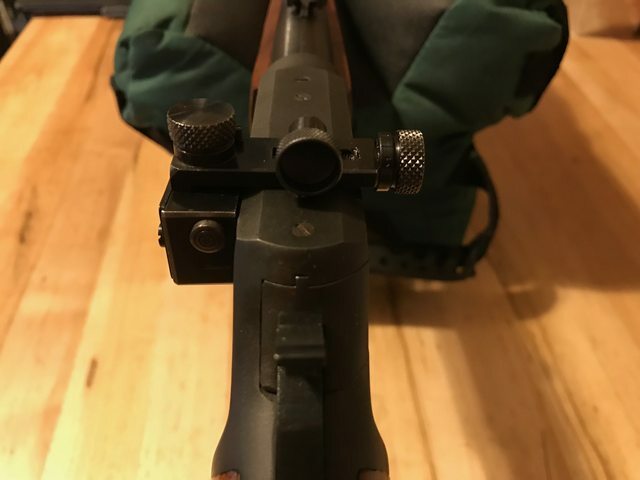 Might consider replacing the original rear sight on the receiver-sighted one with a slot-blank as I do catch a slim portion of it in the sighting picture, though not enough to be really problematic. So, here they are. I'm not the greatest photographer in the world, but I hope y'all love them as much as I do! Anyone here ever measure the 180gr HTP out of a 18.5" tube? 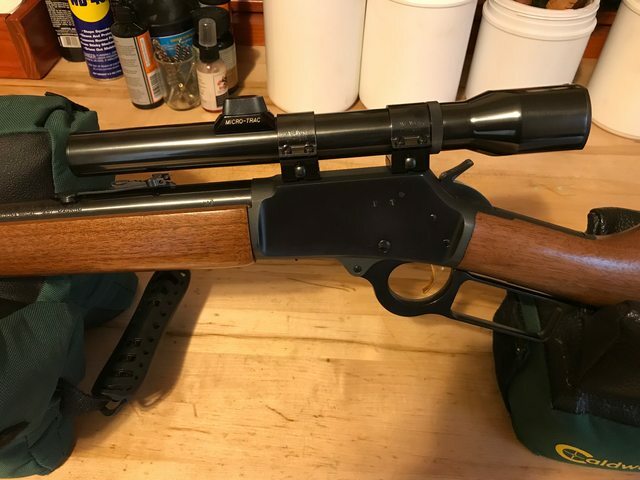 I just recently changed my levergun handle tp "1894c" because I followed your same path (I did this once before...sold what I had...was stuck on stupid). I now own two Marlin 1894C's and one Henry Big Boy Steel Carbine. 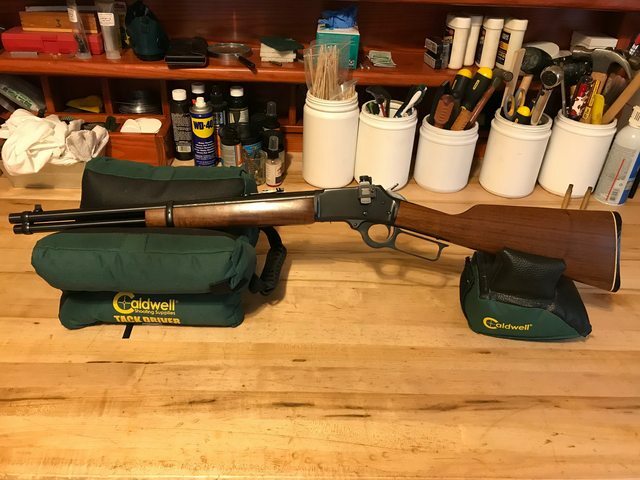 Like yours, my first 1894C was made in 1982 and the other is a 2018 REMarlin. I've decided that that I like the .357-mag more than I like the .30WCF. What drove my decision to go all in for the 1894C was the ability to shoot either .357 or .38-special, the cost of reloading, it's a great rifle to plink with, and that I only Mule-Deer hunt once a year. 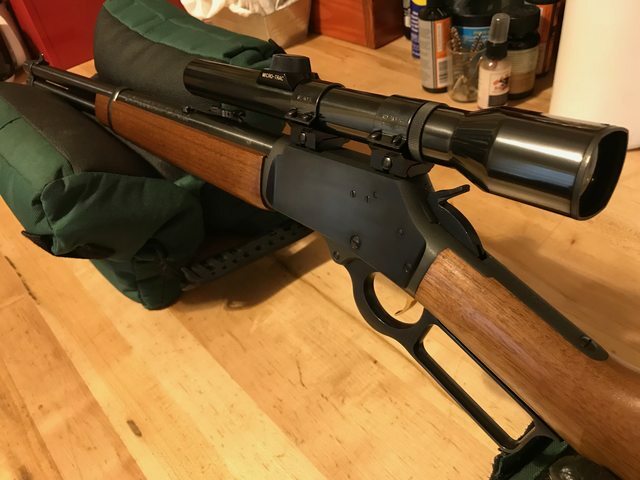 I have receiver sights on the 1894C's and use the factory iron-sights on the Henry (been thinking about putting a rail on the REMarlin in order to install an AimPoint-- an urban assault levergun). Thanks, 1894C, both for the kind words about my amateur pics and for the story about your .357 levers. I should've mentioned in my first post that the ballistics workup was for the carbine with the Redfield. I'll do the same for the scoped one before the range trip this weekend. I also really like your idea for your REMarlin. I'm going after the same basic thing with the Weaver on mine. WIth the wide view (K3-W) and low power it feels comfortable sighting with both one or two eyes open. Clearly not as well suited to that as a LER scope mounted on the barrel or a RDS like you're using, but should work okay. Plus it just fits the older carbine so well... love the straight-wall look. When non-gun-owners ask me advice on what to get, it is usually at least partly for CCW and/or home-protection. I typically start them with a revolver in 357 Mag (Ruger GP-100 if 'nightstand' use, or SP-101 if CCW) and tell them to practice with 38 Spl light loads (or better yet get a 22 LR companion revolver to practice with). Then I tell them to consider a 357 Mag levergun, for ammo compatibility, and it is a good 'home protection' gun. Just that pair of guns would have thrilled a homesteader 200 years ago, or even 100 years ago, and is no less effective these days, with the sole exception of if you're dealing with human aggressors, they may have superior firepower, but for 99% of purposes, that pair will do well. Even if there are several adversaries all armed with semiauto whatevers, then you can still deal with those types effectively if you learn to use your levergun and revolver. (still I'd prefer a semiauto of course). Last edited by AJMD429 on Thu Jan 10, 2019 11:39 pm, edited 1 time in total. They're fun to hunt with, too! Not the SP101, clearly, but the other two for sure. At bowhunting ranges the 6" 686 works well, and with the HTP a 1894C has more energy at MPBR distance than that (at least on paper). Pretty cool. To me the 180gr is a good load for hunting within the range of the setup (125yds to maybe 150yds max), but I may purpose the two carbines differently. I plan to look at 125gr JHP loads for the receiver-sighted carbine based on its potential home defense / close-range tactical role. I would be concerned about 180gr for that role, at least the home defense part, due to over-penetration. If you're of the ".30-06... turning cover into concealment for 100 years" school, that choice might not apply. The scoped carbine will definitely be hunted. What do you think he meant by “splatter soft targets”? Was that praise or a damning comment? A bit beat up from carrying but works well even after dark. Last edited by Paladin on Wed Jan 30, 2019 8:01 pm, edited 1 time in total. when you get past 60 years old Skinner sights can be your best friend. Indeed there are. Great quote of his, btw. Thanks for that. GREAT finds and rifles. I don't have one in .357 but carry the .44 MAG often. I have a red dot on it as even with my latest pair of glasses I can't see the sights well enough, as I used to . Thanks, Paladin. Aging eyes have been the bane of my shooting and hunting life. Biggest hardship for me has been progressive lenses. Still haven’t fully adjusted to them (recovered from them???) with handgun shooting. I try to not spend money on modern guns. Only so much to divert from family/life into the hobby space, and I want most of that for old milsurps. A rig like the above, though... well... it’s tempting. I looked at those for the receiver-sighted 1894C. Would have gone with them too, if I hadn’t stumbled acrross the Redfield on eBay recently. It was pricey as hell, but I had looked for an old steel Lyman or Redfield for frickin’ ages with no luck and I ponied up. One advantage the Skinners have over the Redfield or any other old sight is the pairing with better front sights. I hate mixing and matching aftermarket parts and the Skinner front/rear sets look great. You got a nice pair. I don't often say that to another fellah. Thanks, wm. I like the concept of pairing and usually think about my utility guns (and sometimes my collectibles, cuz I don't honestly shoot every single one of them) that way. Big revolver for open carry and mid-size or little one for concealed carry, hunting rifle and small belt-gun for feral animals or dispatch. Matching .357 carbines, one receiver-sighted and one scoped, and so on. In the last case, one is none and two is one. Cute kids you got there mos. And that Redfield receiver sight is some real class. Thanks! Would've been thrilled to find any steel Lyman 66 LA or Redfield 70 OM, but a Redfield 80 OM with the target knobs was amazing and worth the coin! In my best imitation of Napoleon Dynamite, "LUCKY". Good choices! I had two at one time, they got to valuable to keep...can't remember what I bought with all that money......oh well. This is plagiarized from someone else, but I love it! I was born a gun owner. I didn't become one later in life. Les - That's often how my horse-trading goes as well. I've looked back on too many of my trades and sales with deep regret. Hope the solicitation didn’t kill the conversation. I’ll post a range report when I can. Looks like an ice storm here this weekend so it could be a bit. Have an 1979. Slick as can be as are a 35 Rem and a 375 of the same year. Sounds like a nice trio. All ‘79? Got pics? How are they set up? 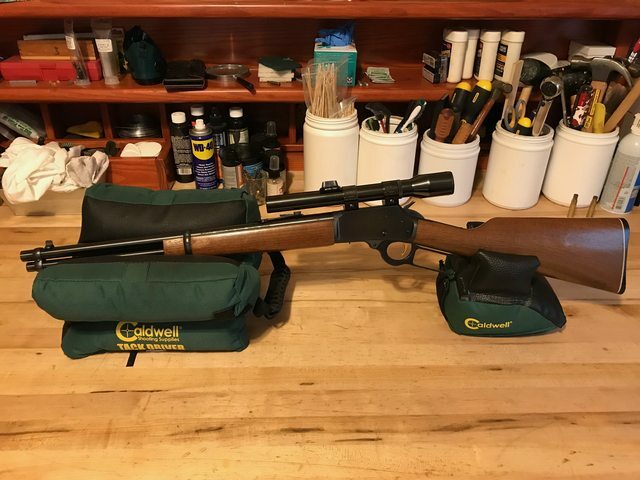 Great guns and you pictures are better than mine, Please let me know which one you like the best, I find that my scoped guns stay in the safe more than my peep sight guns. I am not sure why, my scoped guns work great, but i just grab the peep sights. very confident with them . I agree with peep sights for over 60, tried a Skinner on my trapper a.e. and increased sight radius was major improvement for me, i liked it so much put one on my 20 inch a.e. and put a providence / Lyman 21 reproduction on my Miroku 30-06, 1895. all increased shot groups greatly. still have to shoot 1895 at longer ranges to mark index on Lyman reproduction. Appreciate the kind words, Plottman. For me it depends on usage. I’ve been hunting in low light early and late in the day and had to hold a shot with a peep-sighted rifle because I just didn’t think I could ethically take it. Pretty sure in each case that with a scope - even a low powered one - I would’ve been able to take the shot. I actually enjoy shooting (and definitely carrying) rifles without scopes more than scoped ones, but if I ever need to be sure of a shot at the edge of my clear range of vision (shorter all the time) or in low light conditions, I’ll take a scoped rifle (or ML) every single time. At the range? Irons win. Less likely to go through/past a target and injure someone a half mile away. Plenty of power to deal with barnyard pests, feral cats, raccoons, and your average meth-head. I DO like. Very much. Counterpoint to my own prior comment, the one case in which I would take irons/peeps over a scope is the 0-50 yard tactical role. Field of vision and completely natural/easy both-eyes-open bullet-onto-brass thing wins over my low-power Weaver. Your receiver and forward-mounted RDS rigs surely beat that out, though. Nice work, sir. I particularly like the tube-mounted light. I'm also a fan of the 357, although mine is the 1894 CB with the 20" oct. barrel. 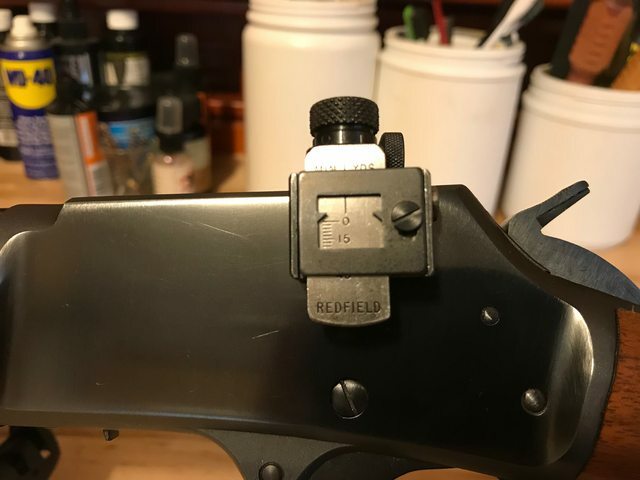 I do like the look of that Redfield receiver sight on yours. Mine wears a Lyman, but for good looks I'd switch to one of those Redfields, if they were less like hens teeth over here.